We are main supplier of Resof-L to Russia. Resof-L Tablets is a anti-viral medications. Resof-L is a combination medicine having Ledipasvir and Sofosbuvir which is used in the treatment of Chronic Hepatitis C Virus (CHCV) infection genotype 1. 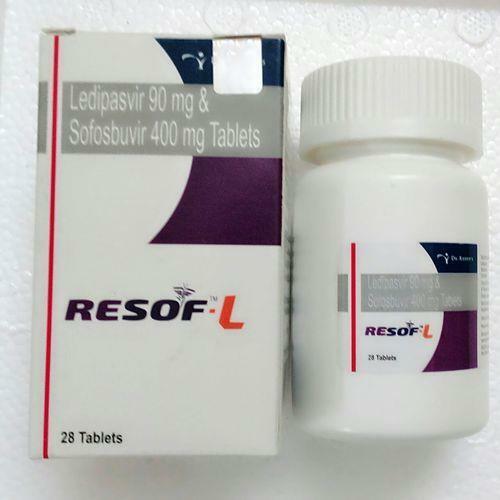 Resof-L is a prescription medicine containing Ledipasvir (90mg) a viral NS5A inhibitor and Sofosbuvir (400mg) a nucleotide inhibitor of the viral RNA polymerase. The international brand name of this medicine is Harvoni that provides effective treatment in Hepatitis C. Resof-L helps prevent Hepatitis C Virus infection from multiplying or increasing in human body by weakening the virus and inhibiting its reproduction and replication. Dosage & Administration - As recommended by your doctor / physician / medical practitioner.